Playing with color paint is a great tool for children to learn the basics in color theory. When you begin, you don't even have to give them the theory and all the hullaballoo, just let them paint and create. The really cool thing about this is that you can create challenges and limits without taking away their creativity. When you place creative limits on a project, you are not setting your child up for a cookie cutter project but getting them to think outside the box. Tints, shades and tones are a nifty way to challenge your child while enforcing their foundation of color theory. You may or may not have already done some color mixing, let's mix up some more using only a base color and white paint. When you add white paint to a base color you are creating a tint. Add black and you get a shade, add gray and you get a tone. Most school art lessons will dally in tints and shades using primary colors. At home, you can have your kiddo choose any happy color they like (or stick with primary, it's up to you) plus white. Physically painting and seeing the changes in the initial color is super cool. Sometimes they will not even notice it until their paper is covered. I use inexpensive acrylic because of the color choices. When working with a group of children, I will use a washable paint but when working with one to three kiddos, I bring out the acrylics simply because the colors are more interesting than what Crayola offers. Acrylic paint does generally stain however so make sure you set up and give your kiddos a smock or have them wear their "paint clothes". If painting indoors and above carpet, make sure to lay out a splat mat of sorts. The paint can be mopped easily up from a wood, tile or other smooth floor but once it hits carpet, all bets are off. This project utilizes good old fashioned newspaper for a couple of reasons. It's cheap, it's recycling and it actually looks extra spiffy once it is all dry. Set up work area and squeeze a bit of base color onto paper plate. A small to medium blob is a good place to start. Have your kiddo dip their paintbrush into the water to wet the bristles to prevent the paint from drying too quickly (thus ruining the brush). Blot it a little bit on the splat mat and then dip into the base color. 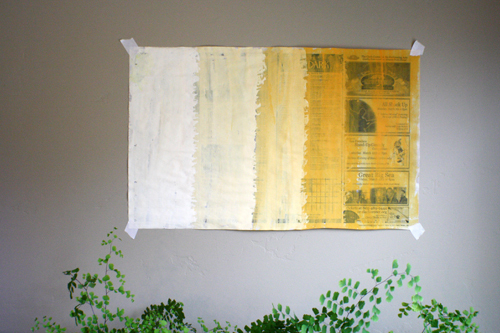 Next, have your kiddo paint a vertical column on the newspaper at one end. I would recommend beginning on the opposite side from which hand they use. This way there should be less paint trapped under elbows and wrists. I'm a lefty so I began on the right side of the paper (the nephew began on the left). If the brush gets too dry, re-dip into the water, blot and continue. After the first column is painted (I would estimate about a two to three inch wide span), have your kiddo squeeze a little bitty bit of white paint into their base paint, mix it up and repeat the process; adding a new column right next to and up against the first. 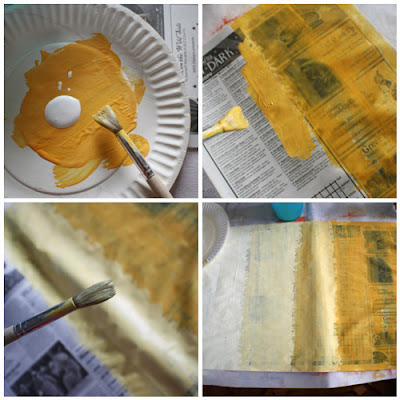 Continue along until the entire newspaper sheet is covered. Add a bit more white first before moving on to the next column. Depending on how much white you/your kiddo adds, your final column may actually BE white. If you think there is not enough variation between the initial columns, up the ante of the white paint. Set aside to dry. Once it is dry, it can be put on display. I think they look like abstract art and look extra spiffy on a wall using painters tape. Or put it aside to use as collage paper or hold onto it for a couple more ideas I will soon be posting. Get a little slap happy and create more! Try mixing up a secondary color first before creating your tint palette. 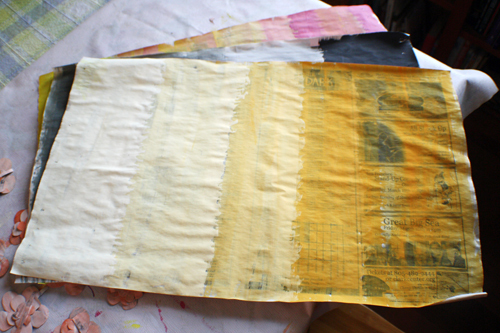 Instead of columns, paint big blobby patches. 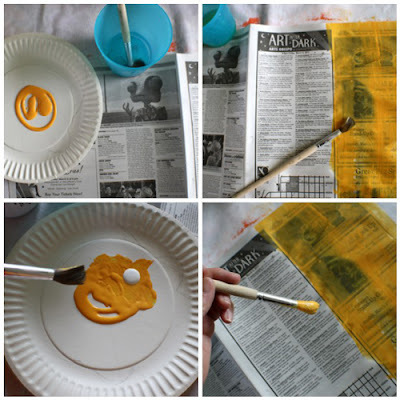 Paint rocks or sticks, use cardboard or put the whole project on a large canvas. This is something to have fun with, have fun! What a great, easy idea. We'll definitely be doing this one! phonebook pages are wonderful too! so much paper just itching to be used!